AMMONNEWS - His Majesty King Abdullah on Sunday at Al Husseiniya Palace received Mauritanian Special Presidential Envoy and Minister of Culture, Handicrafts and Relations with Parliament Sidi Mohamed Ould Maham, who delivered a letter from Mauritanian President Mohamed Ould Abdel Aziz. King Abdullah asked the minister to convey his greetings to the president and people of Mauritania. Discussions at the meeting covered bilateral ties and regional developments, as well as the importance of maintaining coordination on issues of mutual concern. 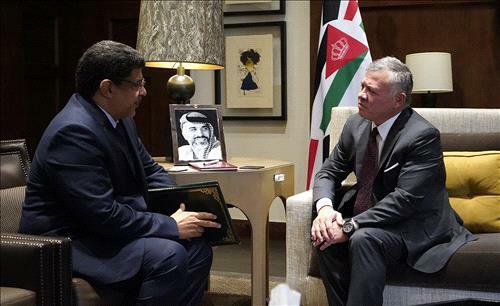 His Majesty noted the longstanding, brotherly ties between Jordan and Mauritania, expressing keenness to expand cooperation in the best interest of the two peoples and in service of Arab and Islamic causes. The King stressed the importance of supporting joint Arab action and uniting positions on the various challenges facing the region. Royal Hashemite Court Chief Yousef Issawi and Adviser to His Majesty and Director of the Office of His Majesty Manar Dabbas attended the meeting.